GOAL: Toprovide children with the individualized skills they need to succeed in the classroom and in life. 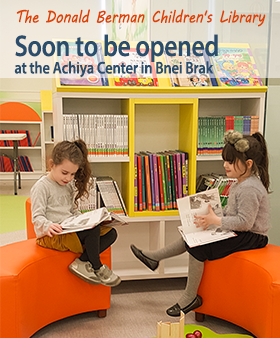 Founded in 1993, the Achiya Learning Center has 20 years of experience in helping children in need of intensive remedial intervention beyond that which can be provided in a classroom setting. Our staff works together to create unique and comprehensive learning plans for each of our clients. Yet, since a large percentage of our clients come from a slow socio-economic background, Achiya’s fees are highly subsidized. In addition, several major social service organizations, including Yad Eliezer and Kupat Ha’ir, refer their clients to us. After an initial intake by Yochanan Eisen, clients are given an appointment with either Rabbi Dovid Unger, Didactic Diagnostician of our Reading & Writing Division, or with Rabbi Yaakov Weingarten , Didactic Diagnostician of our Gemara Comprehension Division. Their job is to diagnose and evaluate the problem, and then decide which of the Center’s 21 teachers are best suited to help that particular client. During the original diagnostic session, many of our clients are referred to additional specific evaluations such as for functional visual problems. The Center’s senior staff closely monitors each client’s progress and supervises all the teaching plans. Tzvi Rudrich works with the teaching staff to help them create lesson plans, and summarize and evaluate progress.